And here they are, my knitting and non-knitting friends (insert imagined drum roll here, please) the finished Koigu PPPM socks! Yes, they are finished and on my feet as we speak. It’s sort of pathetic, I suppose, that I finished them at o-dark-thirty this morning and then planned my outfit around my new socks. Sad, but true. What’s even sadder is how immediate was my desire to cast on another pair of socks. And the winner is (another drumroll, please) basic stockinette socks in Regia Jacquard with purple, blue, and grey stripes. 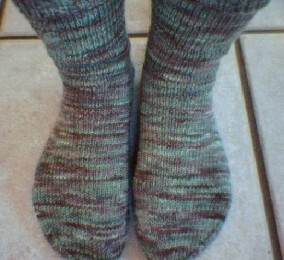 I was all set to try something a tad more complicated, like the Peaks ‘n Valley socks from Knit Socks! but since this here is a self-striping jacquard I decided that anything with a pattern would just fight with the jacquard striping. I’ll save the Peaks n Valleys for the Jawoll.